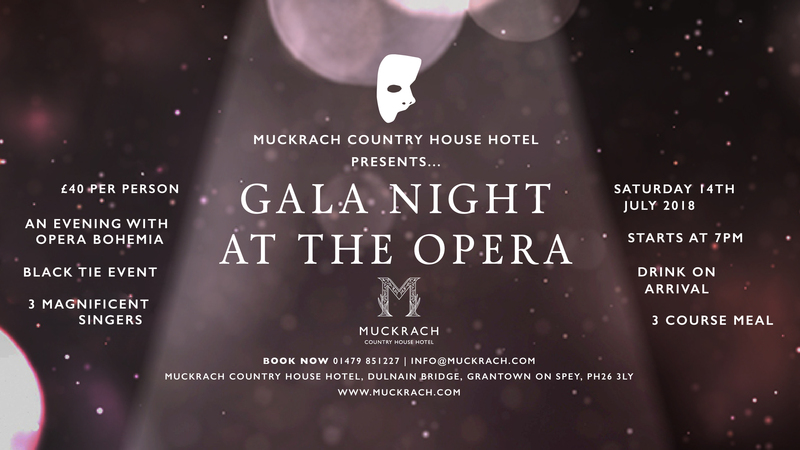 Introducing the first Gala Night at the Opera at Muckrach Country House Hotel. Held at Muckrach on Saturday 14thJuly 2018. Join us for this black tie and highland dress event. Arrival drinks at 7pm where you will be welcomed to take a seat for the 3-course dinner whilst the Opera Bohemia’s three magnificent singers entertain you! During the summer evening enjoy a spectacular night of entertainment. Tickets are available at Muckrach reception and are priced at £40 per person. Opera Bohemia are the group that are bringing opera to the next generation. The company has performed at over forty venues across Scotland including the first opera at the new Beacon Arts Centre and an invitation to perform Madame Butterfly in London. The performance raised over a quarter of a million pounds for the Muir Maxwell Trust. They are a registered charity aiming to produce more operatic performances across Scotland, creating opportunities for professional artists and to introduce opera to first time opera goers and a younger generation.